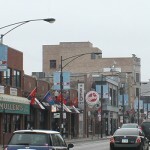 Wrigleyville lies within the Lakeview community in Chicago – bordered by Ashland, Halsted, Byron, and Roscoe streets. The area takes its name from Wrigley Field, the home of the Chicago Cubs baseball club since 1916 and one of the most historic sports venues in America. The iconic stadium and its surrounding residential area make up one of the most unique places in the city. As might be expected, the sports bar is king here. During the summer when the Cubs are in town, the area boasts an almost carnival-like atmosphere, with fans coming from all around to cheer on the home team. Clark Street hosts many excellent restaurants as well. The Wrigleyville neighborhood is filled with many beautifully rehabbed Victorian grey-stones. Two and three flat buildings and multi-unit condominiums are also plentiful. Both buyers and renters will find opportunity here. The distinctive style of this neighborhood give it real charm, to go along with all the festivities that the area offers. Wrigleyville is well served by public transportation. The Red Line CTA station is just steps from the ballpark, and many busy bus routes also pass through the area, including the #22 (Clark) and #152 (Addison). Plus, residents have easy access to Lake Shore Drive, so the entire city is within easy reach.